Your special day is here! Happy birthday to you my dear. We've sat back in amazement watching you come into your own. You may be small in stature but your spirit and personality are huge. You love a good beat and a tune and can shimmy like the best of them. And when the day is done, your head nestles in my neck with hands tucked between us for the warmest cuddle on earth. You're a natural in the water and will dive right in, no fear! Give this little girl a toy bucket and you'll fill it up and spill it out over and over and over... But those tricks are getting old and you're more interested in becoming the world's best standing baby. Slowly you get up with no hands, and ta da! you look around the room for your audience who at this point is clapping and cheering you on. Our little family feels complete with you and our love for you is endless. We are all so proud of the one year old you've become and savor every moment watching you grow. Kisses and hugs baby girl! This birthday girl was precious in pink for the occasion. Pink is a rarity in our home but this velvet number by Rachel Riley needed no convincing. The heavier fabric drapes beautifully and makes for a classic winter party ensemble. Since we'll be spending a quarter of this year in London, I'm making a list of our favorite UK designers for wee ones and at the top is Rachel Riley, a brand that epitomizes classic British styling. A birthday hat fit for our little princess. Over the years we've tried our fair share of birthday hats, crowns and the like for that special day. I've always wished there was something better out there. Thin elastics tend to irritate little necks and crowns don't always stay put for the duration of a party. We were fortunate to come across the wonderful felt flower shop, Fancy Free Finery. Katie's creations are beautiful and festive. 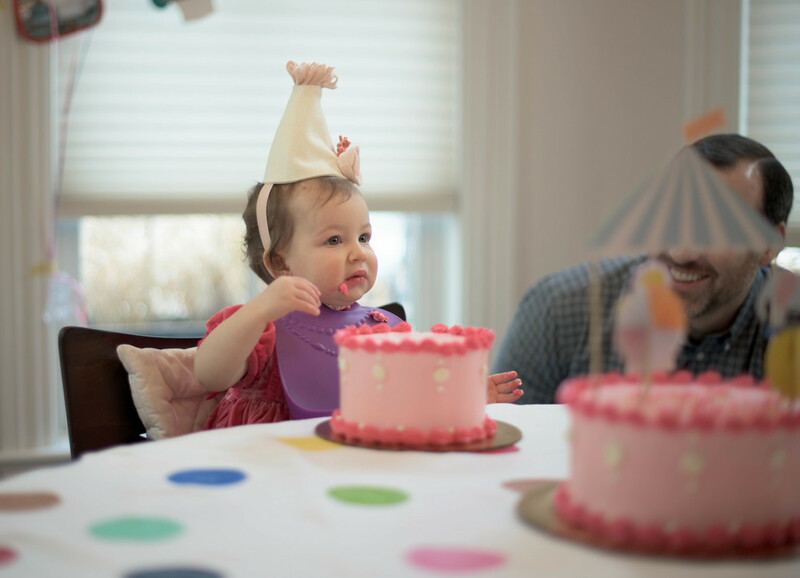 We practiced wearing the hat before her party (call me crazy!) but there really was no need. With a comfortable wide elastic bow, she was content as can be and fancy free. 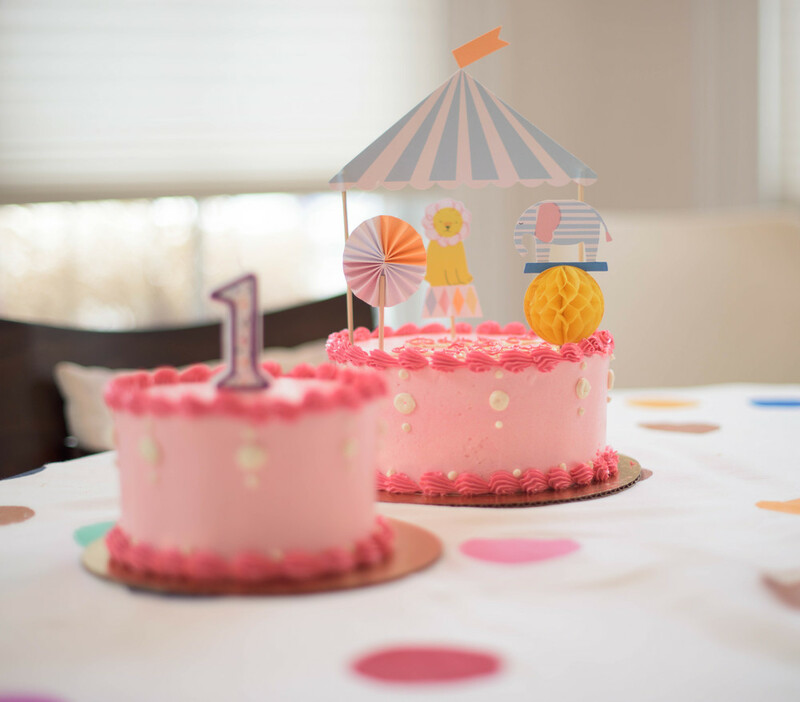 For Elise's first birthday, we had a polka dot theme which carried over nicely to Mila's circus themed party. The Happy Birthday sign was made by another wonderful felt artist, Lori at The Felt Market. Paper goods from Meri Meri were the perfect addition to the festive atmosphere. This was the most intimate of our birthday parties yet and perhaps my favorite. It is still up for debate which sister enjoyed it more. To our little girl who lights up our everyday, we wish you all the happiness in the world! !